to honor Patrick, Ireland's patron saint. hear my faith-cry for them who are more thine than mine. Saint Patrick was not actually Irish. Historical sources report that he was born around 373 A.D. in either Scotland near the town of Dumbarton or in Roman Britain the Romans left Britain in 410 A.D. His real name is believed to be Maewyn Succat he took on Patrick, or Patricus, after he became a priest. He was kidnapped at the age of 16 by pirates and sold into slavery in Ireland. During his 6-year captivity he worked as a shepherd, he began to have religious visions, and found strength in his faith. He finally escaped after voices in one of his visions told him where he could find a getaway ship and went to France, where he became a priest and later a bishop. 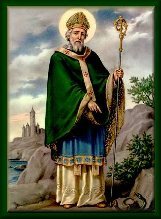 Legend has it that Saint Patrick drove all the snakes out of Ireland that they all went into the sea and drowned. I don't know why he did this, except that the snake was a revered pagan symbol, and perhaps this was a figurative tale alluding to the fact that he drove paganism out of Ireland. converting the Irish to Christianity (in the A.D. 400's). heritage has had a profound influence on our nation. 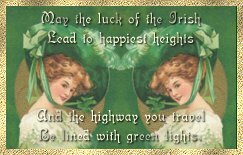 The St. Patrick's Day custom came to America in 1737.
celebrated in this country, in Boston. it is the color of spring, Ireland, and the shamrock. And I am Irish, too! Combine gelatin, 1 Tablespoon sugar, and salt in saucepan. until mixture thickens slightly. Stir in mint jelly. Chill until mixture begins to thicken. Beat in remaining sugar until mixture holds a stiff peak. Fold meringue and 2 cups whipped topping into custard mixture. Add green food coloring to desired shade. Turn into crust. firm. Let stand at room temperature for 2 hours before cutting. Sift together flour and salt. Make a well in the center. Add the cooled melted butter and some of the water and egg yolks. Work in the flour and beat until smooth. Add remaining water. stiff but not dry. Fold into batter mix. Peel, core and slice apples (slices about 1/4-1/2 inch thick). Dip into batter and deep fry in very hot oil (175-180C) until golden. Patrick's Day parades, the largest held in New York City. Elder of Money Is By Renee Thank you Renee! !